On October 25, 2016, the Vatican provided instructions that clarify the Catholic practice of the burial of the deceased and the conservation of the ashes in cases of cremation. These instructions were sent to all funeral directors along with all the clergy in the diocese. Summarizing the instruction, for Catholics the ideal is for the body to be at the Funeral Mass of the Resurrection that takes place in the church, after which burial occurs in a cemetery. The Catholic Church does permit cremation. The ideal is that the body is present for the funeral liturgy and afterwards the body is cremated. However, the deceased may be cremated prior to the Funeral Mass and the cremains be present for the Funeral Mass. The cremains are to be either buried or placed in a sacred place. §3. Following the most ancient Christian tradition, the Church insistently recommends that the bodies of the deceased be buried in cemeteries or other sacred places. In memory of the death, burial, and resurrection of the Lord, the mystery that illumines the Christian meaning of death, burial is above all the most fitting way to express faith and hope in the resurrection of the body. By burying the bodies of the faithful, the Church confirms her faith in the resurrection of the body, and intends to show the great dignity of the human body as an integral part of the human person whose body forms part of their identity. She cannot, therefore, condone attitudes or permit rites that involve erroneous ideas about death, such as considering death as the definitive annihilation of the person, or the moment of fusion with Mother Nature or the universe, or as a stage in the cycle of regeneration, or as the definitive liberation from the “prison” of the body. §5. 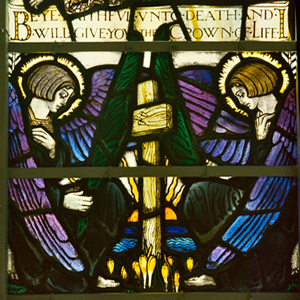 When, for legitimate motives, cremation of the body has been chosen, the ashes of the faithful must be laid to rest in a sacred place, that is, in a cemetery or, in certain cases, in a church or an area, which has been set aside for this purpose, and so dedicated by the competent ecclesial authority. The reservation of the ashes of the departed in a sacred place ensures that they are not excluded from the prayers and remembrance of their family or the Christian community. It prevents the faithful departed from being forgotten, or their remains from being shown a lack of respect, which eventuality is possible, most especially once the immediately subsequent generation has too passed away. Also it prevents any unfitting or superstitious practices. §6. For the reasons above, the conservation of the ashes of the departed in a domestic residence is not permitted….Nonetheless, the ashes may not be divided among various family members and due respect must be maintained regarding the circumstances of such a conservation. §7. In order that every appearance of pantheism, naturalism or nihilism be avoided, it is not permitted to scatter the ashes of the faithful departed in the air, on land, at sea or in some other way, nor may they be preserved in mementos, pieces of jewelry or other objects. §8. When the deceased notoriously has requested cremation and the scattering of their ashes for reasons contrary to the Christian faith, a Christian funeral must be denied to that person according to the norms of the law. "In memory of the death, burial, and resurrection of the Lord, the mystery that illumines the Christian meaning of death, burial is above all the most fitting way to express faith and hope in the resurrection of the body." For the full text of the Instruction promulgated by the Congregation for the Doctrine of the Faith click here.